Day 0 (surgery day) & Day 1: I covered that here, but one thing I left out in my drug-induced stupor was that I got several sweet texts from friends. It made my heart happy. My sister, parents and pastor also came and hung out with Alan and me while I waited to be taken back. It made the time and the fact that I was STARVING much more bearable! Thanks to all of you for that! Day 2 (Saturday): The kids stayed with Alan’s parents and Keri during this surgery, and they returned home on Day 2. 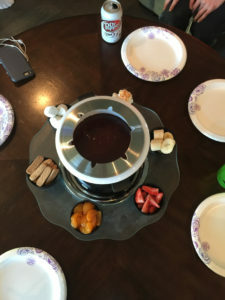 This also happens to be New Year’s Eve, and it is our tradition to have chocolate fondue and play games on NYE. I wasn’t going to miss it. Alan is the hero who made it all happen – making the fondue, cutting up all of the food, etc. I made it through the festivities. The main thing that I struggled with on Day 2 (and Day 1 for that matter) was pain and the ability to take a deep breath. Not only did it hurt a lot to take a breath, but I couldn’t actually get the deep breath. 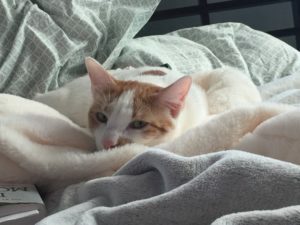 When I would lay down, I would almost have a panic attack feeling like I was suffocating. I finally came up with the idea to take a couple puffs of my inhaler, and that made things much more bearable. Oh, and one other great thing was when I was in the bathroom in dim light and I SWEAR there was paint dripping down the corner of the bathroom wall. I swear, guys. It freaked me out so I turned on the overhead light right away and it was gone. After testing with the light off and on, I called Brynlee in (she hanging out with me a lot that day), and she didn’t see it. It was there, but she didn’t see it. So, I called Alan. He didn’t see it either. He kindly told me to go to bed. Guess the pain meds made me a little whacky! Breathing issue was better, but still there. Day 4 (Monday): Another quiet day, but I went most of the day on just ibuprofen. By the end of it, I was antsy to get out of the house and actually feeling a little bit hungry for the first time. I talked Alan into taking us out for pizza. That wasn’t my smartest move. By the time we arrived, I felt completely exhausted. So exhausted that it hurt and that I actually felt like I was vibrating. It was terribly uncomfortable. By the time we got home, I had to break down and take some pain meds. Day 5 (Tuesday): The main problem I fought on Day 5 was just exhaustion and nausea that would come out of nowhere. That said, I worked from home all day on a project that only required my brain and no interaction with others. When I did interact with others, I really didn’t have much to contribute. My brain is slow. Day 6 (today): I actually feel more normal than I have yet. My brain doesn’t feel foggy (probably because I haven’t taken pain meds in quite awhile), and I have taken breaks between working to keep my healing momentum up. I think I’ve officially turned a corner! I’m so thankful for those who have brought us dinner and/or checked in on me. We really appreciate being surrounded with love. I’m still waiting on the pathology for the ovary that was removed. I’m trying not to focus on that too much. Can’t worry until I know what to worry about, right? Easier said than done, but I’m working on it!